Mount Shasta is a spectacular sight no matter where one views the mighty mountain. Most people who observe it do so from somewhere along the I-5 corridor. The views from the interstate are without doubt exceptional. 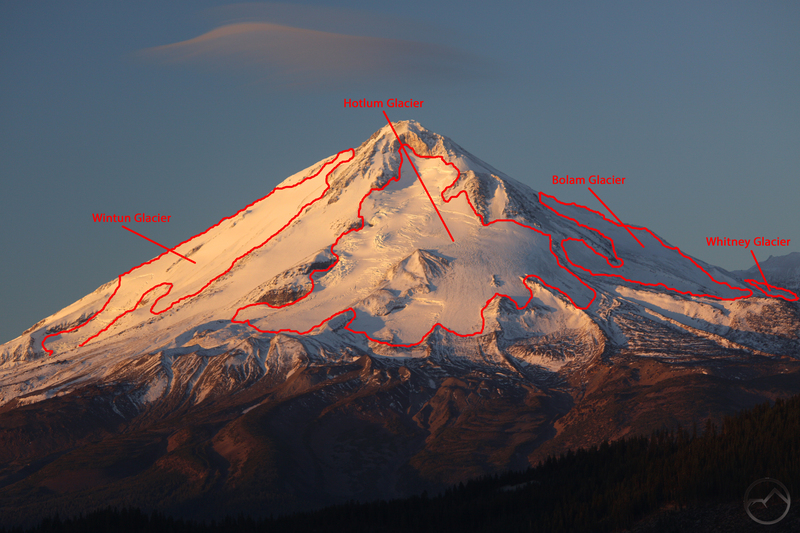 However, I think that one of the best features on Mount Shasta are the four massive glaciers, the Whitney, Bolam, Hotlum and Wintun, that cloak the volcano’s north and east flanks (there are three small glaciers on the south side but they are tiny compared to their northern and eastern neighbors). Two of these vast sheets of ice, the Whitney and Bolam Glaciers, can be observed while driving south on I-5 through the Shasta Valley. Though this is a tremendous view from a freeway, it still does not take in the Hotlum Glacier (California’s largest glacier) and the nearly-as-large Wintun Glacier. These glaciers are more difficult to observe because they are on the isolated east side of Mount Shasta. No major roads or highways pass this side of the volcano, drastically reducing the number of people who have the opportunity to witness these incredible glaciers. Most people who do set eyes on this lonely side of the mountain do so while climbing Mount Shasta or one of the higher peaks that mark the Cascade Crest as it passes the giant mountain’s eastern flank (worth noting: Mount Shasta does not lie on the main divide of the Cascades, instead it is a massive outlier, falling well west of the crest). If viewing the Hotlum and Wintun Glaciers while hiking is what you want, the only option, and it is an excellent option, is to hike the Brewer Creek Trail. The beginning of the trail has great views of the Hotlum Glacier, including large icefalls where the glacier is pouring over rocky cliffs beneath the sheet of ice. If hikers continue on to gorgeous Ash Creek Falls, there are great vistas looking up Ash Creek Canyon to the Wintun Glacier. For those not looking to explore Mount Shasta on foot, there are a couple of good places where one need only climb a short distance to get a chance to see the incredible spectacle of Mount Shasta’s east side glaciers. 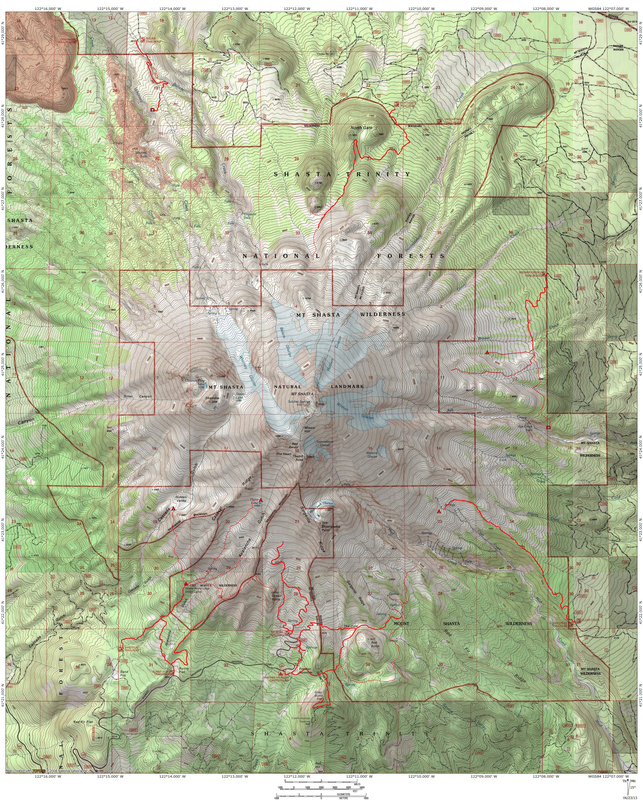 This is particularly true from various points on the Whaleback, a tall volcano northeast of Mount Shasta. Though the Whaleback is one of the highest summits among the peaks that surround Mount Shasta, it still falls nearly 6,000 feet short of great mountain’s towering height. Still, there are spots on the Whaleback where can obtain wondrous views of the glaciers. Some even afford a rare glimpse of all four of Mount Shasta’s giant sheets of flowing ice. While the outlines may not be precisely correct on every corner of the glaciers, it gives an idea how extensive they are. When years with light winters come and the mountain loses most of its snow on the west side, it is always encouraging to know that a short drive or a great hike can bring us within view of these staggering glaciers. Nowhere else in California boasts glaciers that compare with those on Mount Shasta. Though they are not as large as some of the epic one found further north on peaks like Mount Rainier, Shasta’s glaciers are still among the largest in the Cascades and demand respect. As always, if interested in finding this spot, send me an email and I will be glad to give directions.